Leo’s eleventh edition of Company Accounting has been updated to reflect the various and ongoing reforms as a result of Australia’s adoption of the International Financial Reporting Standards (IFRS). This edition provides an authoritative and reliable overview of the various changes required within the framework and a selection of key accounting standards governing corporate entities. Hear from Practitioners: Exclusive videos from high-profile practitioners to provide insights into the real-world application of accounting. 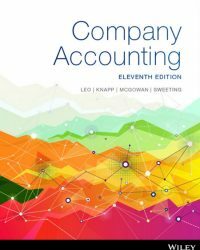 Group Accounting Focus: This new edition has been restructured to align with a group accounting course, focusing on disclosures and consolidations. Interactive Revision Sets: Revision questions at the end of every section help students check their comprehension and get immediate feedback. Search Functionality: The full text search functionality allows students to quickly identify all instances of a key word or phrase. Highlight and Annotate: The colour-coded highlights and note-taking application allow students to tag and add their own notes to important content. Note Exporting: Students can copy and export sections of text together with bibliographical information and print out selected content to prepare for exams. Ken Leo, BCom (Hons), MBA, has been an academic for over 40 years, including 20 years as Professor of Accounting at a University in Western Australia. During this time, he has taught company accounting to undergraduate and postgraduate students. He has been involved in writing books published by John Wiley since 1981, and has also written books and monographs for other organisations including CPA Australia, the Group of 100 and the Australian Accounting Research Foundation. He was a founding member of the Urgent Issues Group, serving on that body from 1995 to 2001. He subsequently served on the Australian Accounting Standards Board from 2002 to 2007, both as a member and as deputy chair of the Board. John Sweeting, BEc, MEc, PhD, CPA, CA, was Senior Lecturer in Accountancy at Queensland University of Technology. John’s background includes a mixture of academic and business positions. He has taught at Swinburne University of Technology and the University of Central Queensland, and has spent time with the National Companies and Securities Commission (now the Australian Securities and Investments Commission). John has also held positions with a large international chartered accounting firm and a company listed on the Australian Securities Exchange. In addition to running in-house courses for accounting firms, John has also conducted Professional Development courses for CPA Australia and The Institute of Chartered Accountants in Australia. He has also been actively involved in both the CPA Program and the CA Program.